We love a delicious piece of simple, pan-fried fish, and Sea Bass is a particular favourite of the other half’s! 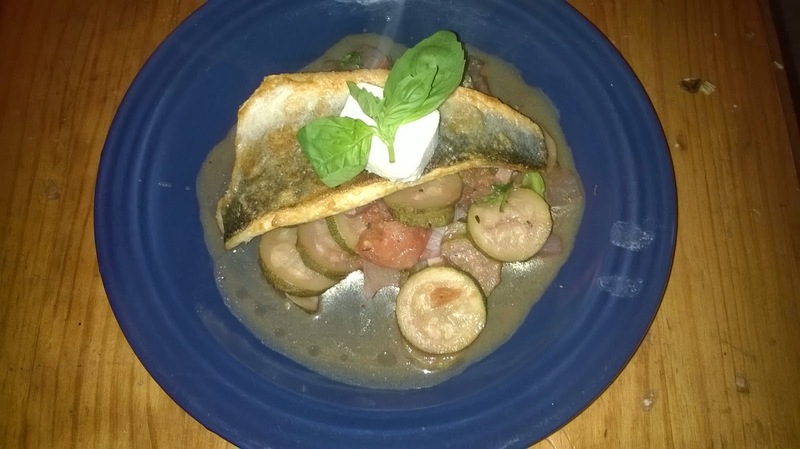 As he’s on a health kick at the moment, I served the Sea Bass with ratatouille and just a little slice of the left over goats cheese from yesterday. You could use tins of chopped tomatoes in the ratatouille rather than fresh, but I like the chunkiness that fresh tomatoes give the dish. This recipe makes extra ratatouille, so you could stretch this to serve four if you have extra Sea Bass fillets around. It only takes about 30 minutes to make. 1. Chop the onion and add to a casserole dish with 1 tablespoon of the olive oil onto a medium heat. Cook for a couple of minutes, then add the chopped garlic and thinly sliced courgettes. 2. After 2-3 minutes (stirring regularly), add the red wine and let it bubble down, then throw in the chopped up tomatoes. 3. Allow to cook on the medium heat for 15-20 minutes, until the veg are cooked through. Towards the end of the cooking time, add the chopped basil and season. 4. Put a frying pan on a high heat with the remaining olive oil. Season the skin of the fish and then put in the pan, skin down. Sizzle skin side down for 3-4 minutes, then turn the fillets over, turn the heat off and leave in the pan for 30 seconds to cook through. 5. To serve, place the fillets on top of a generous serving of ratatouille, then top with a slice of the goats cheese.